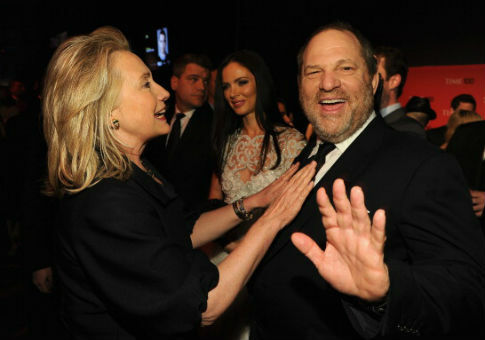 Hillary Clinton has finally commented on Harvey Weinstein being accused of numerous incidents of sexual misconduct and assault, saying Tuesday that she was "shocked and appalled by the revelations." Clinton's communications director, Nick Merrill, tweeted out a short statement from the former presidential candidate, for whom Weinstein, a major Democratic donor, had thrown past fundraisers. "I was shocked and appalled by the revelations about Harvey Weinstein," Clinton said in the statement. "The behavior described by women coming forward cannot be tolerated. Their courage and the support of others is critical in helping to stop this kind of behavior." Clinton received criticism for not coming forward sooner to denounce the accusations against the Democratic mega-donor and prolific movie producer. Weinstein has been fired from The Weinstein Company since his alleged actions came to light. Some Democrats have announced they are donating contributions they received from him to organizations that fight sexual assault. Weinstein has donated thousands of dollars to Clinton throughout her political career. He maxed out donations ($5,400) to Clinton's failed 2016 presidential campaign and gave more than $30,000 to the Hillary Victory Fund, a joint fundraising committee between Clinton's campaign, the Democratic National Committee, and more than 30 state Democratic parties. The Hollywood mogul has also given at least $250,000 to the Clinton Foundation. This entry was posted in Politics and tagged Democrats, Harvey Weinstein, Hillary Clinton, Sexual Harassment. Bookmark the permalink.